You should use aluminium foils if you want your Moi Moi to cook in less time than when bowls are used. The meal is also more presentable if wrapped in foils. This is important if you will have guests for dinner or will be hosting a party. If you do not want to make the bags, there's another method that uses aluminium foils but it is quicker and much easier. The method is known as Jacket Moi Moi. There is a bit of work to be done in making the aluminium foil bags for Moi Moi. I do this even days before I cook the Moi Moi. It is best to see how to do this by watching the video below. Cut the foil in pieces depending on the size of bag you want to make. Fold the open edges to make a flat bag, leaving one end open. 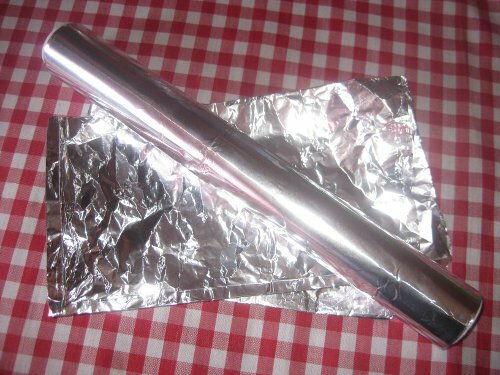 It is always advisable to double the pieces of aluminium foil when making the bags. This ensures the bags do not burst during cooking due to intense heat. Scoop some moi moi mix into the aluminium foil bag through the open end of the bag. Just as in the case of bowls, it is advisable to keep the contents only up to half of the folded aluminium bag. This is because moi moi rises during cooking. If the bag is filled to the brim, it will burst during cooking with the contents flowing into the pot and making a mess. When you are happy with the quantity, fold the open end of the aluminium bag and place the bag in a padded pot. Padding should be placed at the base of the cooking pot used in cooking moi moi that is wrapped in aluminium foils. Placing the bags of aluminium foils directly in the pot will cause the bags at the base to burst due to intense heat. The bags of moi moi should be placed into a pot of boiling water and not cold water. This is so that the contents will set almost immediately thereby preventing accidental leakage. The following is a video on how to make aluminium foil bags for cooking Nigerian Moi Moi.